Chevron Corporation announced Tuesday that its 50 percent owned affiliate, Tengizchevroil (TCO), has approved a major expansion project at the Tengiz oil field in Kazakhstan that will increase crude oil production at the site by about 260,000 barrels per day. The Future Growth and Wellhead Pressure Management Project (FGP-WPMP), is currently estimated to cost $36.8 billion, which includes $27.1 billion for facilities, $3.5 billion for wells and $6.2 billion for contingency and escalation. 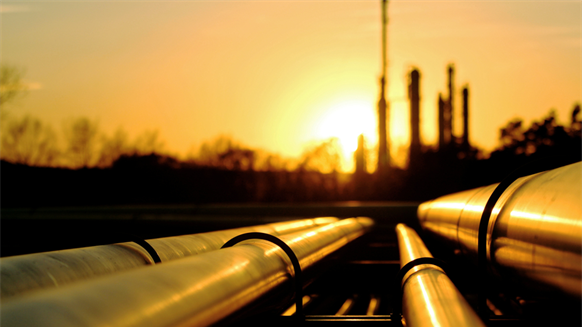 “The Future Growth and Wellhead Pressure Management Project represents an excellent opportunity for the company,” said Chevron Chairman and Chief Executive Officer John Watson in a company statement. “The project builds on a record of strong performance at Tengiz and will add value for Chevron and its stockholders,” he added. The project will raise TCO’s total production to approximately 1 million barrels of oil equivalent per day. WPMP maximizes the value of existing TCO facilities by extending the production plateau and keeping existing plants producing at full capacity. FGP will use sour gas injection technology, successfully developed and proven during TCO’s previous expansion in 2008, to enhance oil recovery. First oil is planned for 2022. The primary purpose of a shale shaker is to remove as many drilled solids as possible without removing excessive amounts of drilling fluid. These dual objectives require that cuttings (or drilled solids) convey off the screen while simultaneously most of the drilling fluid is separated and removed from the cuttings. Frequently, the only stated objective of a shale shaker is to remove the maximum quantity of drilled solids. Stopping a shale shaker is the simplest way to remove the largest quantity of drilled solids. Of course, this will also remove most of the drilling fluid. When disregarding the need to conserve as much drilling fluid as possible, the ultimate objective of reducing drilling costs is defeated. The size of drilled cuttings greatly influences the quantity of drilling fluid that tends to cling to the solids. As an extreme example, consider a golf-ball–size drilled solid coated with drilling fluid. Even with a viscous fluid, the volume of fluid would be very small compared with the volume of the solid. As the solids become smaller, the fluid film volume increases as the solids surface area increases. For silt-size or ultra-fine solids, the volume of liquid coating the solids may even be larger than the solids volume. More drilling fluid is returned to the system when very coarse screens are used than when screens as fine as API 200 are used. Drilling fluid is a rheologically complex system. At the bottom of the hole, faster drilling is possible if the fluid has a low viscosity. In the annulus, drilled solids are transported better if the fluid has a high viscosity. When the flow stops, a gel structure builds slowly to prevent cuttings or weighting agents from settling. Drilling fluid is usually constructed to perform these functions. This means that the fluid viscosity depends on the history and the shear within the fluid. Typically, the low-shear-rate viscosities of drilling fluids range from 300–400 centipoise (cP) to 1000–1500 cP. As the shear rate (or, usually, the velocity) increases, drilling fluid viscosity decreases. Even with a low-shear-rate viscosity of 1500 cP, the plastic viscosity (or high-shear-rate viscosity) could be as low as 10 cP. As with all equipments, jet mud mixer must be correctly chosen and maintained to obtain the ideal working performance. 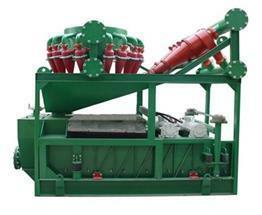 1 Select jet mud mixer which suitable for drilling fluid solids control system. 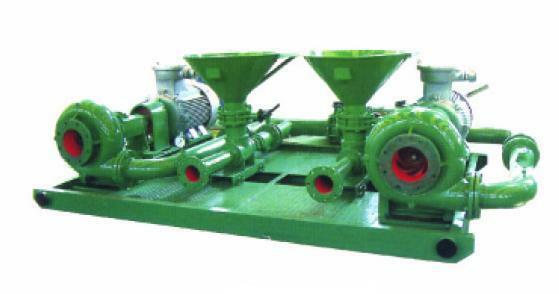 In general, for most solids control equipment, one mixed funnel is enough. If drilling fluid circulating displacement is larger than 4550 l/min, then consider the use of a capacity of 4550 l/min mixed funnel. Usually the speed of adding chemical substances for most jobs, 2270 ~ 3030 l/min is enough. 2 Keep the distance between pipeline and mixed funnel as short and straight as possible. To choose sand pump and motor based on the requirement of system pressure head and flow rate. Jet hopper equipped with matching venturi tube can improve treating capacity, speed up solid diffuse and avoid caking. 3 Users should clean the whole system after using jet mud mixer each time, to prevent drilling fluid drying, and plugging system, especially should pay attention to clean the entrance of the funnel. 4 Drilling fluid mixed funnel should be maintained and checked regularly. Inspected once every 30 days, it is better to spare a nozzle, valve, and casing brush. In the early 1970s, the mud cleaner was developed as an addition to the desander and desilter for reducing loss in the expensive liquid phase. Hydrocyclones discard a slurry, including the liquid phase, which can be expensive over time. The mud cleaner takes the underflow from a bank of hydrocyclones and introduces the slurry to a very fine, pretensioned vibrating screen. The expensive liquid phase and most of the barite pass through the screen and back into the system while the larger solids are discarded. This was the first successful application of a screen, bonded to a rigid frame, using very fine screens. 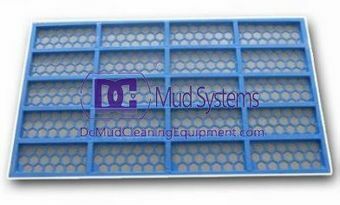 Many mud cleaners have screen cleaners, or sliders, which are circular plastic pieces that vibrate against the bottom of the screen to prevent screen blinding. When the mud cleaner handles the weighted drilling fluid, the drilling fluid which is already handled enters into drilling fluid system from the overfall of the swirler. The drill cuttings, barite and a little liquid phase discharged from the underset and go to the highly detail screen. Because of the granularity of barite is 2~74um mostly, it will return to the drilling fluid system with the liquid phase and the drill cuttings which are smaller than the sieve mesh, the drill cuttings which are larger than the sieve mesh will be discharged from screen surface. 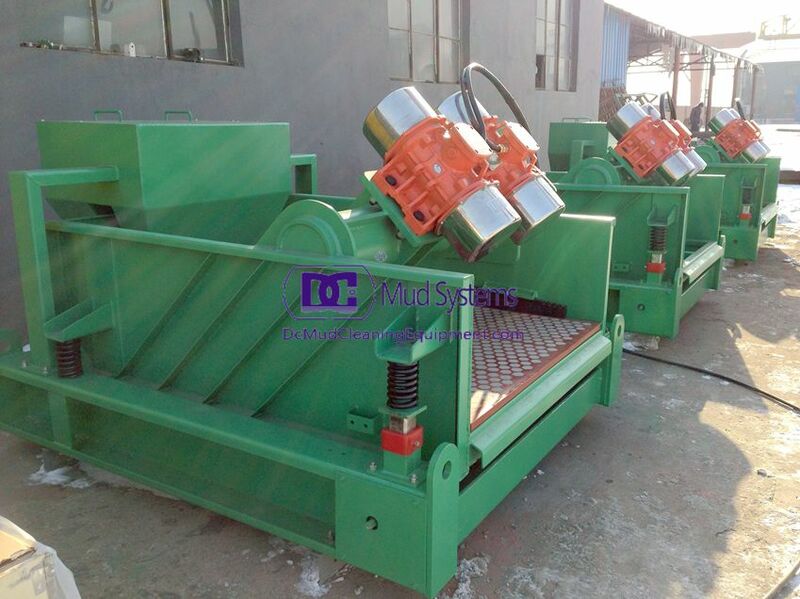 In this way, mud cleaner cleans the drilling fluid, stabilizes the performance of drilling fluid and recycles the barite and the liquid phase. A shale shaker can be used in all drilling applications in which liquid is used as the drilling fluid. Screen selection is controlled by circulation rate, shaker design, well-bore properties, and drilling-fluid properties. Most operations involved in drilling a well can be planned in advance because of experience and engineering designs for well construction. Well planners expect to be able to look at a chart or graph and determine the size and number of shale shakers required to drill a particular well anywhere in the world. They expect to be able to determine the opening sizes of the shaker screens used for any portion of any well. But there are too many variables involved to allow these charts to exist. Many shale shaker manufacturers, because of customer demand, publish approximate flow charts indicating that their shakers can process a certain flow rate of drilling fluid through certain-size screens. These charts are usually based on general field experience with a lightly treated water-based drilling fluid and should be treated as approximations at best. These charts should be used to provide only very inaccurate guesses about screens that will handle flow rates for a particular situation. Screen selection for shale shakers is dependent on geographical and geological location. Screen combinations that will handle specific flow rates in the Middle East or Far East will not necessarily handle the same flow rates in Norway or the Rocky Mountains. The best method to select shale shaker screens and/or number of shale shakers for a particular drilling site is to first use the recommendations of a qualified solids control advisor from the area. Screen use records should be established for further guidance. Shale Shaker is a general term for a vibrating device used to screen solids from a circulating drilling fluid. Other configurations have been tried but have not become commercial. The majority of shale shakers flow the drilling fluid over a rectangular screening surface. Larger solids are removed at the discharge end, with the smaller solids and drilling fluid passing through the screens into the active system. All drilled solids above 74 microns are undesirable in any drilling fluid. 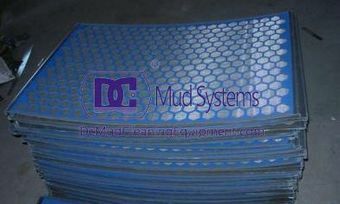 API 200 (74-micron) screens are so desirable on shale shakers for this reason. Weighting materials that meet American Petroleum Institute (API) specifications still have 3% by weight larger than 74 microns. Screens this size may remove large quantities of barite and may significantly affect the drilling-fluid and well cost. Shale Shakers are the most important and easiest-to-use solids-removal equipment. They are the first line of defense once drilling fluid is returned from the well bore. In most cases, they are highly cost- effective. If shale shakers are used with torn screens, fluid bypassing screens, incorrectly sized screen panels, or worn parts, the remaining solids-removal equipment will not perform properly. The operating principle of a mud gas separator is relatively simple. The device is essentially a vertical steel cylindrical body with openings on the top, bottom, and side. The mud and gas mixture is fed into the separator inlet and directed at a flat steel plate perpendicular to the flow. This impingement plate minimizes the erosional wear on the separator’s internal walls and assists with mud gas separator. Separation is further assisted as the mud gas mixture falls over a series of baffles designed to increase the turbulence within the upper section of the vessel. The free gas is then vented through the gas vent line, and mud is returned to the mud tanks. Operating pressure within the separator is equal to the friction pressure of the free gas venting through the vent line. Fluid is maintained at a specific level (mud leg) within the separator at all times. 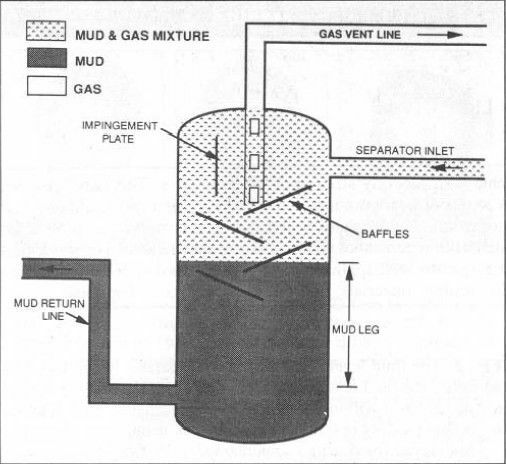 If the friction pressure of the gas venting through the vent line exceeds the mud-leg hydrostatic pressure within the separator, a blow-through condition will result sending a mud gas mixture to the mud tanks. As one can readily see, the critical point for separator blow-through exists when peak gas flow rates are experienced in the separator. Peak gas flow rates should theoretically be experienced when gas initially reaches the separator.